They are not changing back...look at the graph values before you open the small window to change it to see that. I am having the same issue at the OP. I also changed the 316L profile with Jaquith's 3.5. with this sometimes it works. But when i start with a cold atty. it always say Temp protected indicating that it is reaching my desired 450F Temp. however the atty is still cold and produces little vapor. i doubt it indicates the correct temp. Also when i connect it to escribe and reload the profile. it works on the get go. the problem starts again when the atty gets cold. Sadly, it's been difficult. The 316L settings being completely wrong, took me hours to track the info down on how to fix it. Just found this thread and saw that it's still something that people are having issues with and no solid solution. So here goes: I finally got it to work correctly by manually building a profile for the material (in Escribe) and long story short, used the 316L temp coefficient of resistances of 0.00159, then adjusted as per: 68F=1.0, and 800F=1.37. Now all my tanks that I've tested is now matching as close as possible the experience I've always had with all my other mods. I hope this helps anyone that might be having similar issues. I know my wire is 316L, all my non DNA device balance out the very same warmth at the same settings, and what I've done is the only way I managed (after hours of testing with the .00092 parameter that simply didn't work right at all and trying to adjust manually a curve that would give me a better result). And from what I've found online in other forums, etc. including very this thread, not a single place have I found someone stating "this is the solution" and confirmed by every one else that would try it. The few "solutions" looked like patches solutions follow with maybe one person saying that it worked for them, but then others that would say that it either didn't work for them is just temporarily. Right now, my "solution" as worked for all of my tanks (several tested)... and I'm at the point of simply going, if it's working, let's not mess with it anymore. 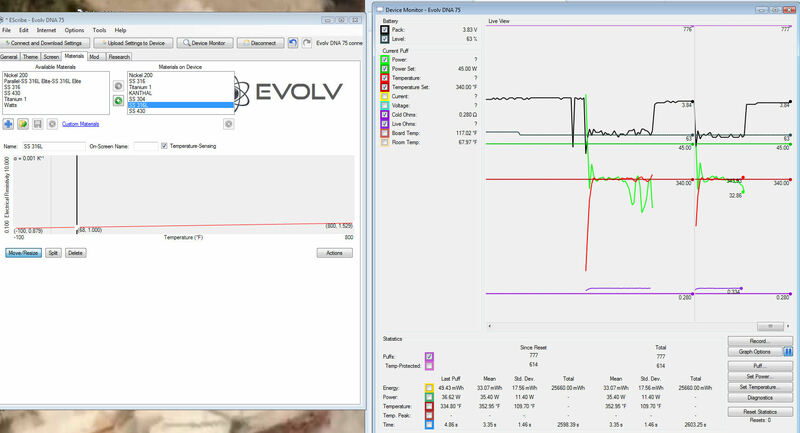 DANG IT, one day later and I'm back to issues where it was fine for a while, then it's back to nothing consistent....I just put the mod down for a few, then I go to use it again (nothing changed) and now I had to increase the temp by almost 200F to get the same warmth. This is getting to be very frustrating. 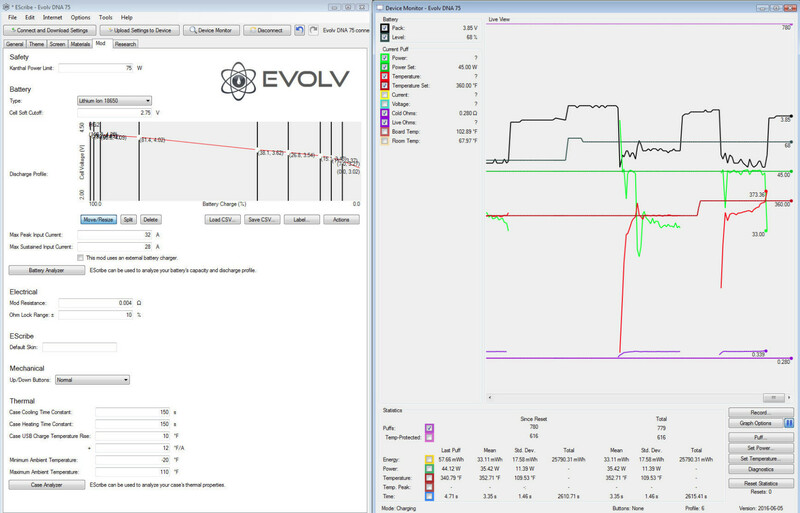 SS can be a finicky critter to work with...can you post a screen shot of your 'Mod' tab in Escribe & one of 'Device Monitor', while firing, with the following boxes checked...Power, Power Set, Temperature, Temperature Set, Cold Ohms & Live Ohms...also, what kind of coils are you using? Coils are a dual RTA built, wires are simple generic. The thing is.. on ALL my "cheap" chinese mods, I have absolutely no issues at all, I can flip the tank from one to another mod (Eleaf, SMOK, Joytech) and put in the exact same settings and get the exact same experience (warmth, and TC cut-off, etc,). Are you using contact or spaced coils? I wanted to see how different a DNA would be, and so far, it's been 3 days of serious headaches and for "more accurate", well.....it's getting ridiculous. Spaced... tested as tested can be, no hot spots or anything. I've been building for over a year, as I said, never any issues, just with this mod.